The sequel to Pandora’s Star continues where Judas Unchained left off, as the Commonwealth struggles as it finds itself under attack from an enemy it is poorly prepared to face. Meanwhile, Paula Myo continues to close in on both the Guardians and the secret behind the mysterious Starflyer and Ozzie continues to wander between different worlds in an entertaining but seemingly slightly unnecessary journey. There isn’t much to say about this book that hasn’t been said already about Pandora’s Star, one advantage it does have is that there are fewer irrelevant subplots (to be more precise, it is easier to see the relevance of the subplots to the story) and it manages to keep up a more consistent pace, not having such a slow start as the first book in the series. Particularly good is the breathless hundred-pages long action sequence as Paula Myo’s team pursue the Starflyer’s agents back to its ship on Far Away, although the Commonwealth’s desperate defence against alien attack also throws up some equally good action sequences. Thankfully, the ending is largely satisfactory, avoiding the infamous pseudo-deus-ex-machina of the Night’s Dawn’s ending. It can be difficult to write an ending that feels like a fitting way of concluding two-thousand pages of story, but Hamilton manages to produce an ending that is mostly satisfying. 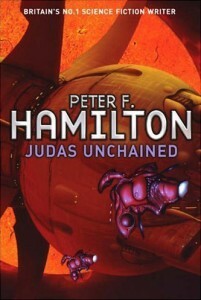 Judas Unchained largely improves on the first book (although since there are fewer unknowns in the plot it lacks the thrill of discovery Pandora’s Star sometimes had) and is another fine piece of Science Fiction that makes a good ending to the two book series.